Puppies love to play rough and tumble and biting is a part of that play. However, when they grow up biting is no longer acceptable and potentially dangerous. 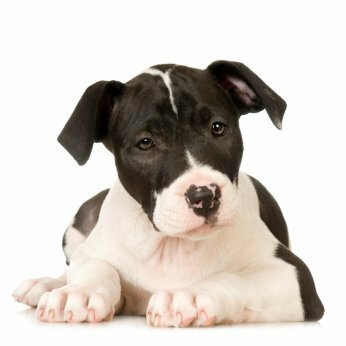 Training your Pitbull not to bite is a process you can undertake successfully at home. This is a guide about training a Pitbull to not bite. I have a 7 month old Pit Bull. She keeps play biting my 14yr old daughter. I have tried everything to stop her but she won't stop. My daughter is the only person she does this to. At one time my own dog always play bit my daughter. I then explained to my daughter that the dog thinks of her as a litter mate. She has to show the dog that the behaviour is not acceptable and to make a very loud noise when the dog tried to nip at her and say no, then walk away. After a short time, my daughter then had control of the dog as the dog learned that she was in fact not its litter mate. Our dog is a beagle. My neighbor had a pit bull. I knew this dog since it was a tiny puppy and it was very loving and playful with me. Then one day it suddenly attacked me out of nowhere. An animal control officer told me that's the way pit bulls are. For centuries they were taught to fight to the death and developed some kind of enzyme in their brains, they can not control their behavior. Please get rid of the dog before it causes real harm to your daughter. Get your daughter a can of breath freshner - you know, the palm-sized little cans you can find when checking out at the grocery store. Everytime the puppy - and he's still a puppy and can be corrected - tries to nip/bite her, she should squirt him right in the face/mouth. Get a strong flavor. This should startle the puppy and it should not take long before he ceases the bad behavior. I also strongly recommend that you get your puppy in obedience classes asap. He needs to learn that the humans he lives with are the "alphas" in his life, and he needs to be well-behaved. Pit bulls have the bad reputation they have because they are well built dogs for bad activities promoted by bad people. But they do not have be bad - it depends entirely on the owner. This is true for any dog. Even a chihuahua can be vicious if not properly raised. As a responsible dog owner, you should definitely put the dog in obedience school, and it is so much fun, you might want to continue with agility training and other schools to keep the dog active, interested, and out of trouble. Good luck! I cannot believe the feedback given here. Every dog deserves to have a life and a family. Pit Bull's are NOT born evil, or born agressive. If the dog is trained correctly and given love and affection, it will NOT maul anyone in your family or around you. You do NOT -again- have to choose between your daughter and your dog. Simply correct the behavior. If you already established yourself as alpha when the dog was a puppy, he/she should understand. If the dog considers your daughter as lower than itself in the pack, that could explain the biting. I suggest being there when the dog tries it again, and in a stern voice say 'NO'. Test if the dog tries it again, if not than it understands the pack-leader, if so than continue the treatment. Your daughter isn't a child, she can defend herself like any adult. She should have also established herself ahead of the dog when it was a pup, this might not have happened. Please read up on what you are getting into before taking an animal into your home, it will save you and the dog grief later on. 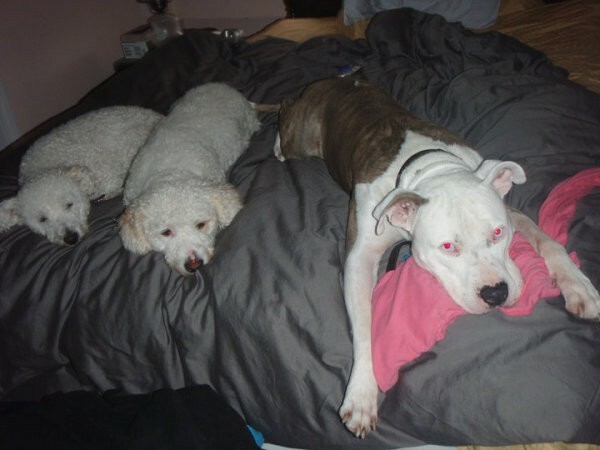 Pitbulls are especially good to study before taking one, as they require owners that usually had a dog previously. You do not need to have your dog euthanized you can easily correct it by having a toy in your hand and when it begins to bite give it the toy and if it continues to bite pluck the dog on the nose. if that does not work contact a professional dog trainer and ask him what else could work. 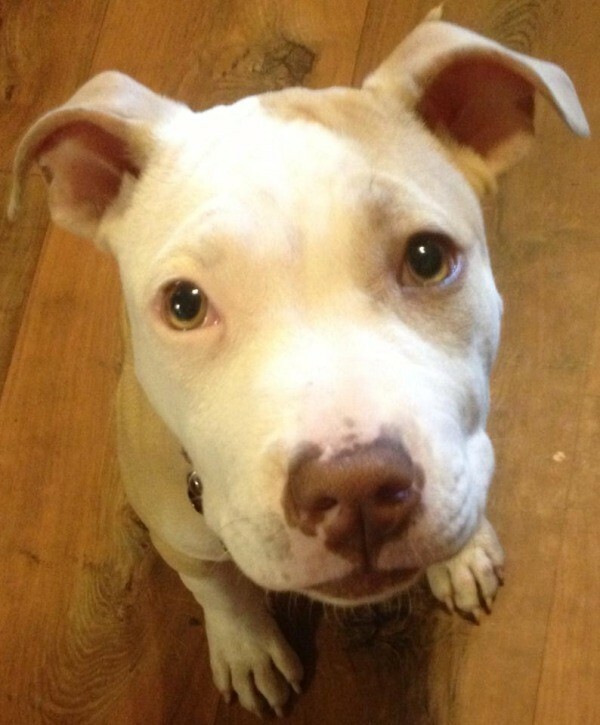 just because its a pit bull does not mean its gonna automatically be aggressive. i have 3 pit bulls and none of them are aggressive in any way so for the people who believe that they need to not criticize 1 breed of dog because a lab or golden retriever could be just as viscous as a pit bull. and its peoples ignorance that continues to make this breed have a bad rep.
How about training? If the pup has been taught not to play bite with others, it more then certainly can learn this from your daughter. If the biting is more then play disregard the following, but its simple if it is all that must be done is training. The owner must teach the daughter how to force the pup into obedience. My 7 year old had this issue with our 12 week old pup and now with the SIMPLE command of OFF, he listens just fine. You might want to be sure that he is neutered as this may help with aggression. Buy a book on dog training and puppy care. Teach the dog proper manners concerning your family and your property. My pitbulls have NEVER bit anyone in their entire lives. All dogs can be trained to be "good" or "bad." If the breed mentioned in the original title was "Golden Retriever" or "American Eskimo", there would be very few demands to destroy the dog or get rid of it. Train your dog, and if possible ( depending on age ) train your own children how to show their dominate status. Hold the puppy down until it stops struggling, remove it's food at times the puppy is eating( giving it back, of course, soon after ). As I said, buy a book - but these are simple examples of showing the dog you are in charge. Do NOT play tug-of-war games, nor allow it to "nibble" on the tips of your fingers. Be clear it is not allowed with a loud clap of your hands, and if necessary, a pop on the nose or rear. Don't hurt your puppy, but make sure it understands "NO!" However it turns out, whatever it's behaviour - it is because it's been either "allowed" to behave that way, or distinctly "taught" to behave in such a fashion. Do not destroy that dog - you have no right to end a life. Find a No-Kill shelter if you feel that training a puppy not to bite is beyond you. Is it common for my nine week old bluenose Pit Bull to be biting? What is the best way to help him to stop? It is normal, that's what puppies do, but it is easily stopped. The next time your puppy goes to bite, put your hand in his mouth and grab his lower jaw firmly and then firmly say "No bite". Do this everytime and he will learn and stop. He will not be able to bite with your hand holding him like this and it doesn't hurt him. This worked with our American Bulldog puppy, hope this helps. Buffalowgal has good advice. I hope this cures your pup! I had an experience with my 8 wk old Dane that was different, though. Being so darned cute, I just could not help but fall for this little 20 lb guy. Morning one with us he started to cry a bit. I grabbed a throw for myself to snuggle on the couch to watch early news. I picked him up and placed him on my tummy. He stared at me, but then went to sleep. Lovely, huh? 2nd morning: He started that pitiful cry, so I grabbed the throw, etc. I picked him up, put him on my tummy, I got the stare. THEN.....he just started biting the %$#& outta me! This started an approx 6 month behavior that was just awful. My husband would come in from work to find me crying and bloody. I was SO frustrated. I had four Danes before him and they were so mellow and great and now I had a MONSTER on my hands. WHAT I DID WRONG: I elevated this intact male pup off the floor and then placed him to where he looked down on me. This gives them the msg that they are superior and he was acting on that. He saw me as a weak pup. NEVER treat a pup like they are a baby! They need to know where they stand from day one and as they grow and learn then they can be rewarded. Outdoors he would see me in the yard and run past me grabbing an arm: more injury. But, remember that pups will do that to each other as they make their way to the top of the pack. It took a LOT of patience and training (not to mention neosporin and bandaids), but I am stubborn and knew that he was a good dog, behind all those big teeth. Today he is 2 1/2 years and is 165#. I am 120#. He only sees me as a pup as far as protecting me, but I could NOT ask for a better dog, he's marvelous! Now I tell him "let's go watch tv on the couch" and he ambles towards the family room, but waits to get the signal if he can sit with me or sit at my feet. I hope the "don't bite" maneuver works for you. Good luck with your cutie. Let us know what happens! I only have one thing to add to all the other bits of advice. Do not think that I have any grudge against Pitbulls, in fact, I love them. The actual findings, according to people like the ones who have handled them (a lot) is that the blue nose pits are always the ones in demand as fighters, and are usually the ones that do get in trouble as adults, for attacks. I think I heard the lady who runs Villa Lobos and has the tv program pit bulls and parolees, was one who mentioned that. Again, I love pits, but do watch, and if the best attempts at training are not successful within a reasonable time, and you have children around, at any time, please be cautious. We dont want more media vilifying such awesome dogs. I grab either top or bottom jaw and squeeze firmly w/ a voice command. If this hasn't helped within a week or so I will add to that grab by taking the lip and press it on their very sharp teeth. Yes, it does hurt a bit, but you don't need to pinch so hard she bleeds! Also, if we're playing and puppy bites too hard, I yelp. I yelp louder than it actually hurt. The pup understands that communication b/c that's exactly what another dog would do. It sounds like this pup may be a natural alpha. If so, it is IMPERATIVE that you learn about dog psychology. YOU, not the dog, are the ALPHA. You and any other members of the family need to treat him like the Omega. For a dog with this kind of personality, it is so much more important to do this from a very small age. Lastly, I would defiantly invest in a large kennel (wire or plastic). For now, he NEEDS to be kept in a place where he cannot chew anything he's not supposed to. It's not fair to get angry w/ a puppy who does not know yet what is ok and not ok in the household... and it is definitely not fair to get angry when the human doesn't put the puppy in a kennel to prevent any accidents. Eventually you will be able to let him in the house alone, but the ONLY way to train him whats ok and not ok is to catch him doing it. So, when you are home make sure you keep a close eye on the little guy so you can 'catch him in the act'. It is still a puppy and the way that I broke my stafford shire (pitbull) of biting is a firm tone just like you would a child. There is no need to physically discipline the animal. They are great companions and are loyal animals. I would suggest getting tennis balls and other chew toys for it to chew on. It is a teething thing just like with a child when they are teething they want to chew on anything to make their gums feel better. When the animal gets older then you will have to mount it to show dominance. I would suggest getting it fixed unless you plan on breeding and if you plan on doing that I would strongly suggest doing a lot of research on them. If you have any questions please don't hesitate to ask. I have been breeding and raising these docile animals for about 15 years. here is a helpful site to get some more information. I hope that it helps. We rescued 2 Boxer mixes when they were 3 months old; a female Teaya, that is 3 years old now and less than a year later a male Tyce, who is 2 years old now. Taeya has severe separation anxiety for which we thought getting her a brother would be a great idea, so we adopted Tyce. Taeya is very motherly and they are two peas in a pod; never had any problems with them. We recently came across a homeless family with Pitbulls living in a park and found out that two of the litter died. Our heart went out to them and we adopted 1 male (Titan) that was 6 weeks old and is not fixed yet. He is now 4 months and we plan to get him fixed, but he has been showing major aggressive behavior recently. First, he would start playing with Taeya, and she can handle it, but then he would start to bite her mouth and we could not pull his mouth open; which terrifies us. Now, he leaves Taeya (female) alone, and has been going after Tyce (male). He bites his mouth and does not let go, whenever we take them on a walk or if we give Tyce attention. Our only methods have been putting him in the crate to calm him down, which works, and then he goes up to Tyce and gives him kisses. But once we walk them, it starts again. We got to the point where we can't walk them together. 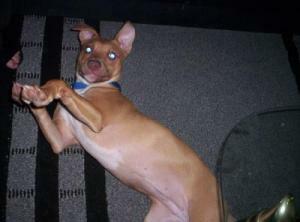 I can only imagine he is trying to establish dominance, but Tyce is a submissive dog. Taeya and Tyce do not defend themselves and I believe they are terrified of his lock jaw. I plan to get him fixed this week and see how they may change; but in the meantime, I need a solution for them to co-exist without my older dogs getting their face bitten off. Then we will most likely find him a new home; our intention from the start was to foster him. I just got a Pit Bull/Boxer mix pup. 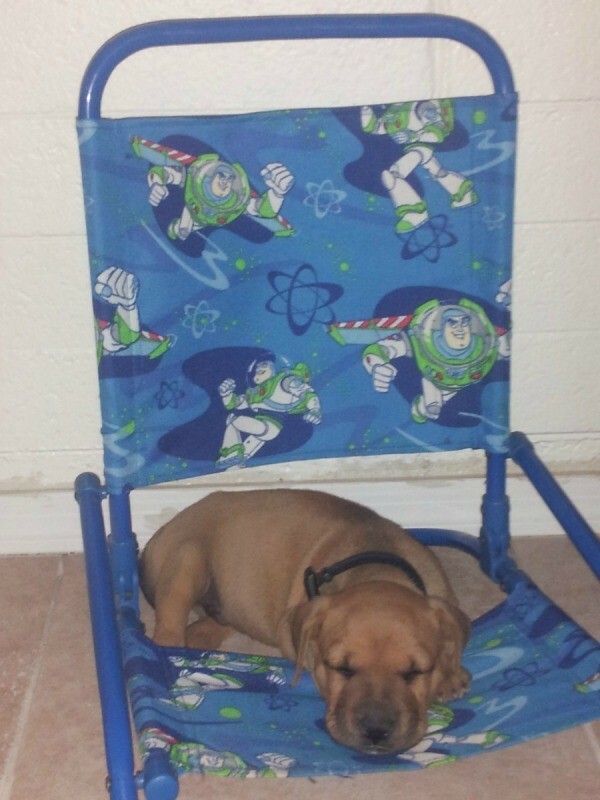 He was 6 weeks old. I have had him for about 3-4 weeks now and his aggression and biting is getting to be too much, especially with my 5 year old son. I have tried smacking his mouth, giving him a firm NO, newspaper against my hand to make loud noise to stop him, putting him in his cage after disciplining him, he just doesn't stop. He goes right back at it. He also gets spiteful when you yell at him for the biting and put him in his cage. He goes in and pees. Any suggestion how to calm his aggression? Pit bulls need a really firm hand. I honestly think they need to be in households with men or very strong women. You don't mention if you have a man in your household. I have no real suggestions, other than to suggest that if you don't get a grip on the problem soon to find him another home before you are eventually sorry (it doesn't sound as though he is behaving like he thinks you are in charge). My son has 2 and they cower when he is gets on to them or punishes them....but he has trained them with an iron fist! And he loves them equally as strongly, don't get me wrong, they are not mistreated in any way. You have a very strong willed dog, something Boxer and American Staffordshire Terrier (AST) dogs are bred for; unfortunately the combination of Boxer and AST has created what sounds like an exceptionally strong willed dog in yours. Using the wrong training (as in TOO firm a hand) will yield a very difficult dog. I've raised AKC Boxers all of my life (I'm 55), my cousin raises ASTs, I've seen exactly what you are describing over the years. The last thing you want to do is use fear to train this kind of dog, it will backfire on you. Boxers and ASTs are very high energy dogs who don't reach physical or mental maturity until around aged three years (although they can breed from about age seven months); they require a very structured environment that includes tonnes of play and exercise periods of up to at least two hours a day. This is a high maintenance dog. They can chew concrete and bricks, so you'll want to be sure to provide lots of safe chewing material (consult your vet for the best and safest products), and keep that crate handy because a Boxer-AST mix should learn to go uncomplainingly into the crate on command. They are also prodigious digger-escape artists, and you should be VERY careful about your Boxer-AST because there are several American, Canadian, and British locales in the process of declaring both breeds and any combination thereof to be 'dangerous dogs'-banned from rentals, neighbourhoods, parks, etc. Any damage he does to person or property will be your legal responsibility if it is determined that he wasn't kept under proper control. 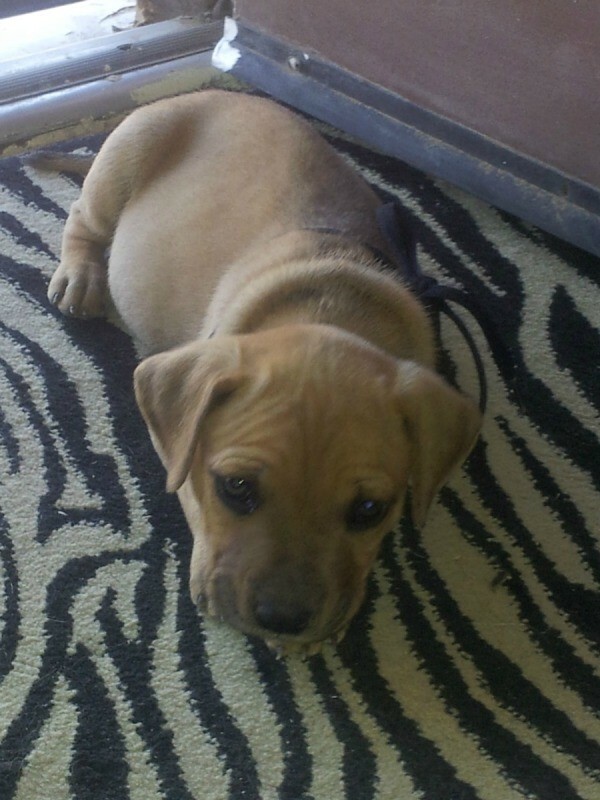 Your best bet with this little guy is to get him into an obedience training group right away. I know he's very young but there are classes out there that will take you and your puppy at this age. You also need to be constantly in 'training' mode with him-don't let him extend play times to the point where he is over excited, and you should maintain a structured environment at all times where YOU are the one in charge. Scheduled walks to use up his extreme energy are going to be a lifesaver for you with him-get him on a harness and out there walking every day for five minutes, then ten, then 20. You want to work him up to at least two walks on a lead of about 30 minutes twice a day; you should also schedule play periods in your fenced yard where he can be supervised off-lead. The urination after scolding is actually him expressing his combination of fear, shame, and yes, his strong will, think three year old telling you "You're not the boss of me!". But he wants you to be, so he's scared, and ashamed he's failed, hence the piddling. There are humane muzzles available that you can put him into if he gets too bitey during play time; you want to have a firm yet patient and calm manner as you strap him into it. Do this after telling him "Time to calm down" in a firm voice. Give him a few seconds to try to calm down, then strap him into the muzzle, and try to get him to sit while petting him as a reward for calming down. Whatever you do, don't use food as a reward with a dog like this because he'll always expect food and won't be satisfied with verbal praise and petting, just food. If you find he is simply more dog than you realised, I hope you will find a rescue group to find him a furever home that can cope with his needs. To be honest with you, although my cousin and I both bred beautiful, healthy, and well adjusted dogs, we also took very great care that we didn't have any Boxer-AST mix litters as experience with rescues taught us combining these two breeds is one of the worst ideas in dog breeding. The above link is a good one for more info on all things Boxer. You can either decide to keep them separated or you can rehome the pup. Either way would work. I would probably get used to having to separate a dog from a young child no matter the breed of the dog. Keeping them separated is the way to work with him but not just give him run of the house. I never give my dogs run of the house if there is a child around, until they have totally proven themselves. I would like to give you a lot of links to start your research, once the child and the dog are happily separated from each other. Lets start with the no free lunch program. Pits or AFT's are my favorites because of their intelligence and character. I love them and have fostered some, and they were each the same, over loving, over jumping, over biting, and it took lots of dedication to get them under control. They really don't mean to be so much trouble but they have this heavy jaw and a need to express their love and to chew and they see their mom didn't get hurt when they bit her so why should you mind? You must always holler out in pain when they mouth too hard and then get up and go away after they have done the over hard playing. They go behind the gate or in to their kennel. Some I have had to get around the scruff and shake them a little, while lifting their front feet off the ground but not their back feet. This is a mommy thing; it is not done violently or two hard. Holding them this way is not fun for them. It is their love of life and their playing and teething behavior that makes them handfuls as pups. They could easily break the skin when you had your back turned IF YOU DONT KEEP THEM APART. If you feel you are able to put as much energy into training and working with the dog as you do with your child, I think you will find the results worth it....and will not have to re-home the dog. I like to spend a lot of time at leerburg.com. 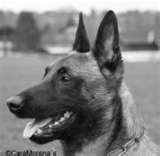 Ed spends his time training German shepherds..for the show and for police work. His philosophy on dog training ebook is great I read it through. People often have to separate forever two dogs in the house from interacting and it is usually because they love them both and the two dogs cannot be trusted with each other. Look at the info on leerburg.com about clicker training. You might also appreciate the videos on how to teach a dog to be happy in his kennel..... (hint: throw in treats all the time....) However much you put into this that is how much you will get out. If your heart is not in it, then find the dog another home, if you are ready to move forward and keep the dog and the child separated until they are both older and more able to be predictable in their behavior, than that will work out too. Remember pits have a strong desire to mouth. Give it milk jugs that have bee washed, and lots of coke bottles without lids on them and with the ring removed. Lots of chew toys, nylabones, etc. Get the really good treats or buy hot dogs to train with. Don't use treats the dog doesn't care about. When you are working with your dog, when he gets mouthy put a toy in his mouth to redirect his behavior. You will approach the care and training the same way a friend of mine did when two of her favorite show dogs would not get along. her schnauzer kept on harassing the lab until the lab attacked and almost killed the schnauzer. The schnauzer would be in a kennel when the lab was out, and they never got to play with each other. Many multiple pit bullie houses have to separated. It is simply their nature....when they are dominant and such, it works out better for all concerned usually. Here are some links. Also remember you can make a clicking sound with your tongue, and I start all my pups out with holding my hand out and calling their name or making a noise. When they come up and their nose accidentally touches my palm, then I click with my mouth, and then praise and pat and then wait a while and do it again. Here is the part of research that is most fun...reading positive info from people who have been there, Here you go and have fun and give the child and the dog a hug from me. How do I get my American Pitbull five week old puppy to stop biting my two year old when she tries to play with it? First of all, a 5 week old puppy should still be with it's mother who will let it know when it's biting her too hard. Second, a two year old child should not be unsupervised around any dog. A child that young has no idea when it's being too rough with an animal, and a dog will respond the only way it can when it's being hurt - it will bite. If there is no mother dog in the picture, you should do some research on training, or better yet, consult a trainer who can tell you the best way to handle the problem. All puppies bite, especially when they're teething, but you do need to deal with it when they're young, otherwise you will have real problems. I TOTALLY agree with suescats. Our behaviorist says pups should be with the mother until at least 12 weeks regardless of wether or not they can eat dry food. The mother's training as far as play biting goes should last until the pups are weaned. The Humane society, aspca, and most rescues don't want to place pups and small dogs in families with children 5 and under. Little ones, especially a two year old, cannot comprehend what their actions mean to the puppy. Something as simple as a quick movement of the arm can entice the pup to bite. Keep in mind: THIS IS NOT THE PUPPY'S FAULT! It is a poor situation for both the pup that you want to work out and the child that you ultimately want to not fear dogs. Is there someone who can do the initial rasing of the dog until it can be trusted with your family? Puppies, no matter the breed, will "bite". It is a teething action. You need to correct the action, and redirect it to something that it can chew on. My Aunt had a great idea that I used with my dog, when she was a pup. Take your dry dog food, and a can of wet dog food (preferably the same brand name), mix it, and stuff it into a kong (for pups, use the puppy kongs). Then, place the kong into the freezer for a couple of hours. This is a great teething toy for your puppy! I kept about 3 kongs on hand, and rotated them from the freezer. Just make sure that the portions you give in the kong, is added to the total amount of food you are feeding in a day. You don't want to over feed. There are several ways to correct the pup, when it tries its teething on you, or your child. If you google puppy training articles, you will find several that will give you ideas on how to stop, and redirect the behavior. I wanted to adopt a 18 month old Pit Lab mix from a rescue. The dog seems friendly towards people. I was informed by the owner of the rescue that the dog was more than mouthy. He bites and doesn't let go and he jumps all over. He has been in this shelter for a year and hasn't had much training. I certainly appreciated her honesty, but for some reason I really would like to give this dog a chance to live in a home. However I also have 2 Labs at home, a 12 yr. old and a 10 yr old. I certainly don't want to jeopardize them. Do you think this rescue is a good idea? Do you think this dog could ever be a normal part of a family? I am at the end of my rope. This is our second Pit (our first was hit by a car at 1 year). BeBe is 14 weeks old and I can not get her to stop biting my hands, feet, legs, and she pulls on my pants leg. I have tried "NO", I have pushed her away, tried to ignore her, tried to give her chew toys when she tries to bite me or chew on my clothes. She has gotten where she barks at me and is getting to be aggressive toward me. I am the primary caregiver and I love her and want her, but she is really getting to be a handful. My boyfriend and I have had this blue nose Pitbull since he was a baby. Now he is almost 4 years old and he has bitten me twice within the past 2 years. The last bite almost caused me to lose my arm. I still want to be with my boyfriend, but I don't like the dog anymore and he's' still in the house. His mom lives with him and she spoils the dog like a child and he stays in the house. I cared for him while he was a baby and I don't understand why he bites me when I cared for him more than my boyfriend during his younger years. And I don't understand why the police did not put him down. I want to remain in a relationship with my boyfriend, but I don't want the dog. 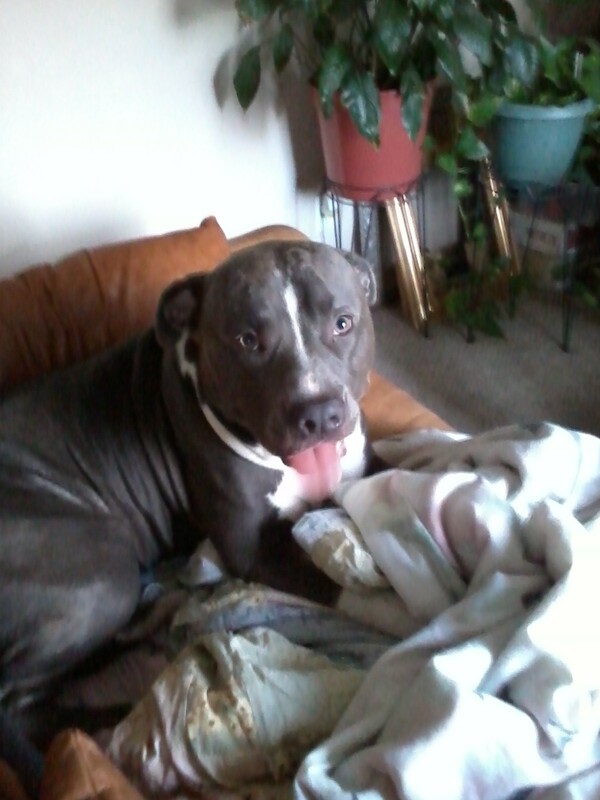 I have this baby Pit Bull and he is about 8 months old now. He is snapping and biting, but only at kids. He use to never do that to the kids as a baby. We have been putting him outside on the chain or in the room when he does and/or spanking him. He has bones and stuffed toys that he plays with. This is the third time he has done this. I love him dearly and if I can't find a way to help him stop then we will have to get rid of him. I really don't want to cause he is my baby. My APBT is currently 8 months old and I have had her since she was 6 weeks old. During this time we have moved three times. Initially, we lived in a situation where she got to play with a few different dogs and see various people. While playing with these animals, she would play normally and occasionally act dominant but never aggressively or too rough. She would not jump or nip at people except my 10 year old nephew who would play roughly with her. Soon after this, we moved in with my parents. My parents spoiled her by not enforcing rules and letting her play roughly with them. After discussing this with them, they stopped for the most part but it seemed the damage was done because she now thought it was okay to jump on people and nip at them. Since then, we have moved into a complex with a roommate. The complex contains many people and animals. She will listen to me when we are alone with only the occasional challenge. However, when we are walking and she sees a person or another dog, she gets really excited, stops listening to me, and tries to pull to get to the person/dog. On the occasions that she does meet someone new (or old for that matter) she will jump on them and nip at them. She does not do this with me, but she does it with everyone else! It makes me nervous that she may hurt someone because she does not realize she is being so rough. She also now plays too roughly with the dogs she was initially socialized around. I just want her to act more calm around everyone else like she does with me. Any advice? I've had my Shar pei/Pitbull puppy since he was 8 weeks old and from then on I stressed how important it was to not let him bite. My fiancee and I went out and got him ropes and treats because he was starting to bite. He is 14 weeks now and he is starting to draw blood and bite harder and bark at our hands. My mom's friend came over and was rough housing with him and letting him bite and bark. I'm afraid I'm going to have to get rid of him. He was a wonderful when he was younger and was good. Now he doesn't listen, he barks, he bites, and he is scratching now. I've tried saying no sternly, avoiding him til he behaved, put him in his kennel til he settled down, and my mom doesn't know what to do so she grabs his jaw spanks him and says no biting. 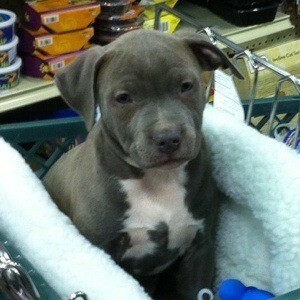 I love my puppy, but this biting thing may lead me to giving him up or my mom just taking him to the pound. 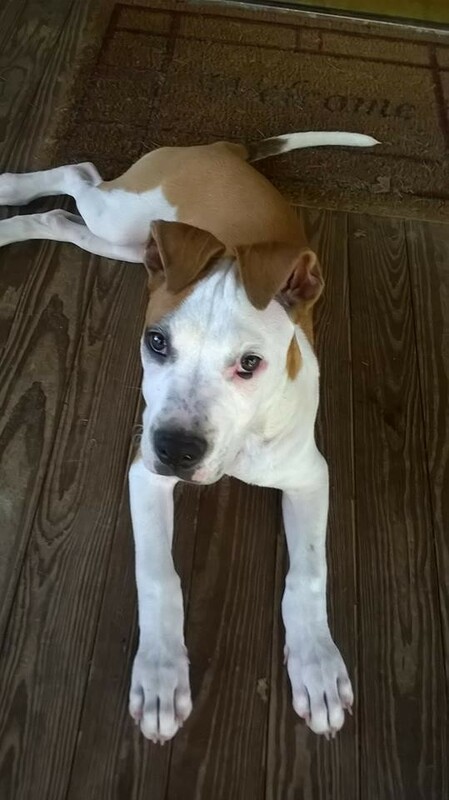 My fiancee wants to get him a muzzle and I want to be able to trust my puppy especially because I may be pregnant and I have a 6 year old nephew. I need to know how to get him to be good and stop biting. I have a 5 week old Pit Bull puppy. How do I stop her from biting people? My mom has a Pit Bull and two other dogs. We got him five years ago from a shelter and he was underweight and not healthy. He now is happy and healthy and loves my mom. My brother and I have moved out for college and he now lives with my mom. He follows her around the house and he is getting very protective (possessive) of her. Now whenever she has any friends over he stares at them and watches their every move and if they move a chair or get up too fast he will nip them. No one wants to come over anymore and we don't know how to make him stop. He is never aggressive towards me or my brother, but he intimates everyone else who comes over and he takes full advantage of it. What should we do? 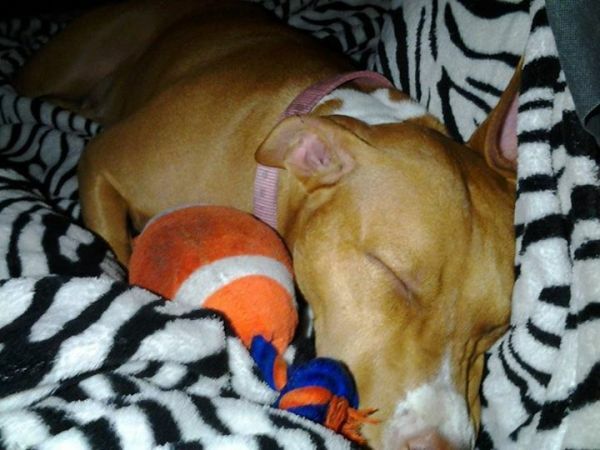 I have a 1 year old female Pit and recently she has been going after my roommate and his dog (which is a male pit) when they come in our room or by us. My roommate came in my room and she bit him and then went and stood over her food and then she went after him again. She also has bitten my boyfriend. What can I do to get her to stop? How do I teach and train my 7 month old Pits to not bite and jump all over people? We have a 5 month old Pit/Lab. We got him a month ago. He had no training. I've gotten him house broken, but we can't get him to stop biting us. He draws blood and is barking at every noise. I need hep fast. He is my baby. First of all, stop treating him like your "baby." If you treat him like a baby, he will think he is your boss and try to boss you around by biting you. You must make him understand that YOU are the boss. Don't let him sit in your lap, keep him off the furniture. Keep his head below yours. Don't talk baby-talk to him. Make him wait to eat. It sounds harsh, but it is a system that dogs understand. You must stop treating him like a baby. He's a dog.